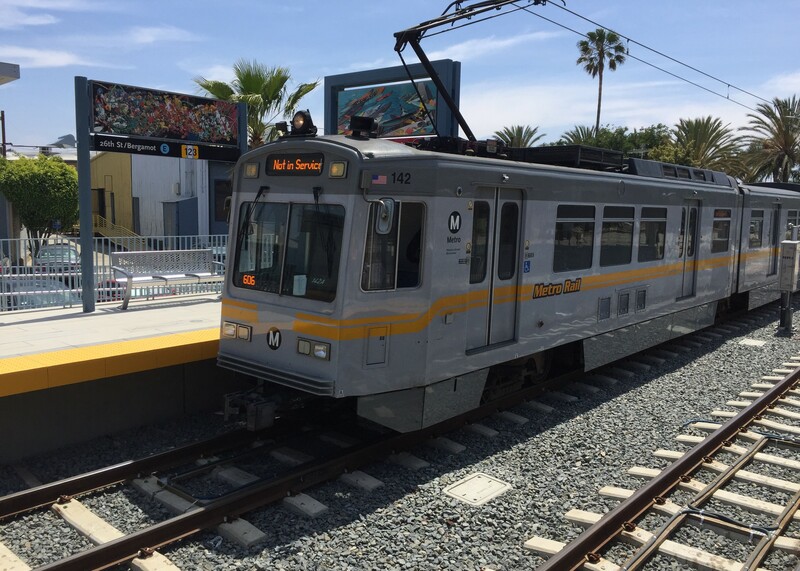 Metro opens the Metro Expo Line to Santa Monica today. Photo: Joe Linton/Streetsblog L.A.
And I notice the one thing no one seems overly concerned about is ridership. From day one the new Expo rail extension will be used. In fact the chief concerns are crowded trains (due to the rail procurement delivery situation that currently afflicts Metro) and the travel time from Santa Monica to downtown Los Angeles being too long. As to the latter I urge all readers of this blog to sign the petition to LADOT that it provide the line signal preemption. I am gratified the petition has generated significant attention for the issue and hopefully it will force officials to finally act. Saturday Southern California Transit Advocates will have a booth at the Culver City station during the community celebration for the opening from 10 a.m. to 4 p.m. A list of vendors and schedule of the musical performers at that location is posted at this link. The purpose will be to share information and engage the public. 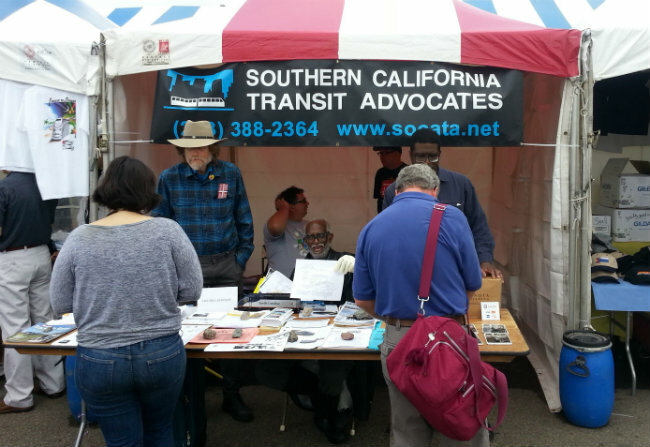 Charles Hobbs, author of Hidden History of Transportation in Los Angeles, will also be at the booth and I expect representatives of the Rail Passenger Association of California and Nevada to also be present. RailLA also has booth at the station. Come by and say hello. Certainly this weekend will be about savoring this achievement, but starting next week we need to rededicate ourselves to build on it because there is still much work to do to facilitate expanding our rail network. On Monday, Move L.A. will hold its 8th annual Transportation Conversation. We cannot be complacent. To build a coalition and pass the Los Angeles County transit sales tax measure in November (which requires securing a two-thirds majority) will not be easy but is necessary. Move L.A.’s forum will be key to that effort and I am attending. I urge all in a position to attend to do so and join our movement to create multi-modal networks (transit, bicycling, walking) that support sustainable communities. The future doesn’t happen by accident. It is the result of vision and commitment. Join me on the front lines and aid the struggle for a better tomorrow. Expo Is Coming, Santa Monica! But When Will It Get Here?